From now until July 31, 2015- BOTH cookbooks are NOW ON SALE! Save 50% off regular price. Price reflected in price at point of sale. 93 pages. 80 Recipes and ALL Nutritional Facts per recipe calculated (calories, proteins, carbohydrates, fats, and fibers). This cookbook was created to help show you that creative, healthy cooking can be fun and easy. You will find within these pages a wide variety of items from entrees to desserts and snacks. K & G Wellness opened their doors in April 2006. Comprised of a husband and wife team with medical backgrounds, their passion is sharing with others how to live a healthy lifestyle. 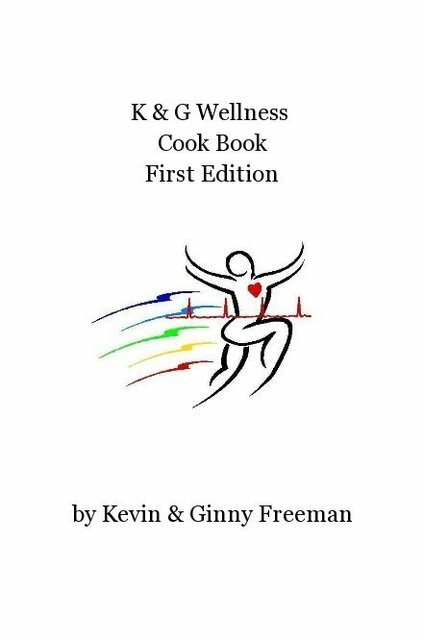 Kevin and Ginny teach their participants of their Nutrition For Life Course that a “diet” doesn’t work. A “diet” implies there will be a start and finish date. To be healthy and manage your weight you truly need to learn how to deal with regular food and incorporate these foods into a lifestyle of eating. Since opening in 2006, through their classes they have helped participants to lose 50,000 pounds as of June 2011. This was an incredible milestone to reach in just five short years. Whether you are feeding your family or hosting an event there is surely to be a recipe within these pages that is tasty and healthy. You will find good, quality ingredients to each recipe. Healthy carbohydrates, lean proteins and the best fats are used in these recipes. We hope you enjoy our wide variety of recipes. We teach our participants how to EAT TO LIVE! We offer a ten-week Nutrition For Life Course that teaches you how you were meant to always eat.